Treasure Hunters: Danger Down the Nile: Booktrack Edition adds an immersive musical soundtrack to your audiobook listening experience! *The sequel to James Patterson's Treasure Hunters is another hilarious, hair-raising adventure for the First Family of Action!Bick Kidd and his globe-trotting siblings Beck, Storm and Tommy may have completed their first treasure hunt after their father was lost at sea, but their kidnapped mother is still in the hands of nasty pirates. 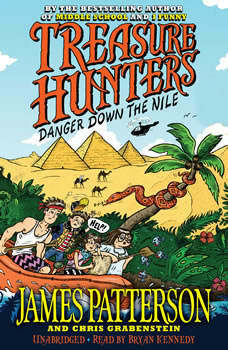 Their search for a rescue plan takes them down the Nile river in Africa, where they'll have to navigate everything from Egyptian pyramids in the desert to wet-and-wild jungles-not to mention life-threatening encounters with wilderness diseases, angry hippos and some seriously bad guys-in order to find the treasure and save the day. *Booktrack is an immersive format that pairs traditional audiobook narration to complementary music. The tempo and rhythm of the score are in perfect harmony with the action and characters throughout the audiobook. Gently playing in the background, the music never overpowers or distracts from the narration, so listeners can enjoy every minute. When you purchase this Booktrack edition, you receive the exact narration as the traditional audiobook available, with the addition of music throughout.